As most of you know, dear readers, I live in Georgia. I’m not sure if you’ve heard, but there’s a little bit of a craze down here over a game called football. I grew up with two brothers, so it was pretty much a foregone conclusion that I would be a sports fan. I have a special place in my heart for one team in particular. So on occasion I like to bring two of the great passions in my life together – football and baking – and make football cookies. So I wanted to share with my readers a collection of tips on how to make great football cookies for your next tailgate or Superbowl party. Blend ingredients in a small bowl with a fork. If icing is too thick, add a drop of milk until it reaches the desired consistency. If it is too thin, add extra icing sugar. A drop of food coloring may be added to create any color you wish! Spoon the icing into a ziplock bag. Close the bag securely. Using a sharp pair of scissors, snip of a very small bottom corner of the bag. Pipe the icing through the corner onto the cookies. Allow the icing to set before stacking your cookies. Second, let’s talk about what cookie equipment you will need. 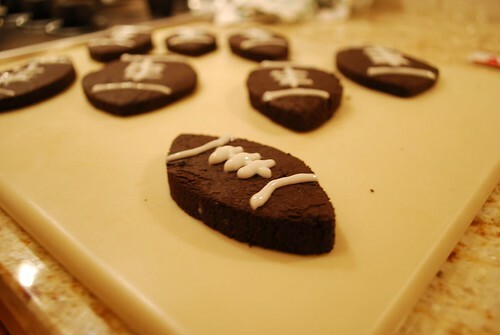 If you don’t have a football cookie cutter, then DON’T WORRY! We can’t all be as lucky as me and have a set of 101 cookie cutters. In fact, I accidentally left mine behind when I went to my parents’ house to make these this year, and they ended up turning out perfectly even though I just used a sharp knife to cut out the shapes. And thirdly, let’s talk cookie recipes. In the past, I’ve made football cookies just by using my football cookie cutter with my regular sugar cookie recipe. Then I iced them with chocolate frosting and drew on the laces with some plain white icing. But that was sort of a lot of different flavors, and I’m not a huge fan of chocolate icing on sugar cookies, so the search continued. Recently, I discovered this wonderful recipe for Brownie Roll-Out Cookies from Smitten Kitchen’s blog. 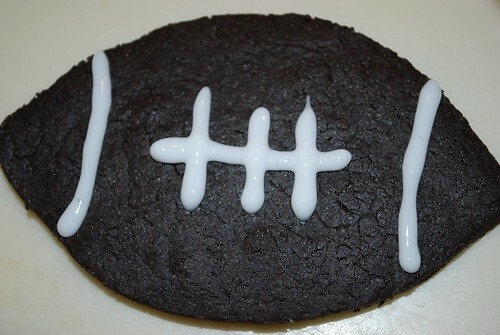 I knew immediately I’d found a new recipe for my football cookies! No need for chocolate icing, just draw on the laces like so . . . They turned out GREAT and were a big hit at our little Superbowl gathering. Next year, I think I’ll try making gingerbread football cookies – they are the perfect pigskin color!